All Souls was designed by Parr, Strong and Parr (ie A P Strong) (B 43 p127) and consecrated in 1882. It cost £18,500 (KD 1899) and is built of butter-coloured brick with dark red terra cotta dressings. As it stands on poor ground, the foundations were 17 to 20 ft deep (A 28 p59). Its Italo-Byzantine style, derived from Ravenna, differs from almost any other Anglican church of the period. Nicholas Antram points out (BE(E) p333) that as a presumed pupil of T H Wyatt, Strong would have known his master’s design for the church at Wilton, Wiltshire, but that dates from 1841-45. Thus, Strong’s willingness to design a church in this style may also stem from his partial training in Germany, where choice of style was a less doctrinaire matter. 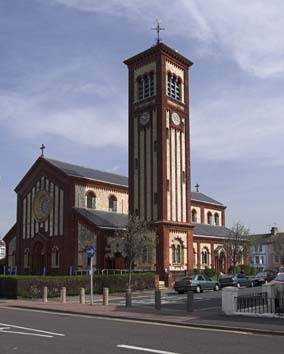 The exterior is dominated by a tall campanile, almost free-standing, with vertical bands and a low pitched top. 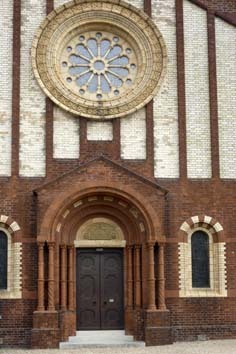 The west front of the church has a large wheel window and at the other end is a shallow apse with a dwarf gallery outside beyond a chancel area. The open, impressive interior has carving by Farmer and Brindley (B 43 ibid), including big Byzantine capitals on the seven-bay arcades, the heads of which have voussoirs of alternating colours. 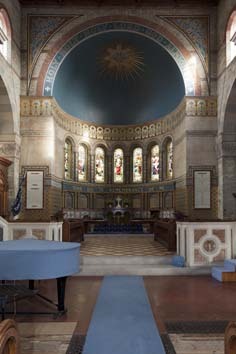 Like the early basilicas on which it is modelled, all except the apse is roofed by heavy, unadorned trusses; the apse is painted blue and gold. 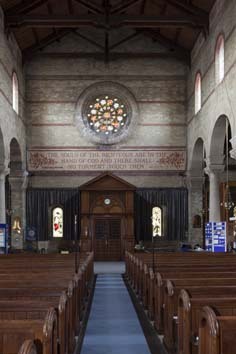 In keeping with the church’s evangelical tradition these comprise texts rather than anything more pictorial and either side of the apse tablets bearing the Creed, Commandments etc are incorporated as part of the original design. This work, designed by Strong, was nearing completion in 1885 (B 47 p51). The tiled floors were supplied by W B Simpson and Son. and so was the verse from the Book of Wisdom in the Apocrypha on the west wall, a rare instance of a text in a church taken from this source. The east end has lost much of its original appearance because of later alterations, but originally there was a low stone and marble wall across it. The church was bombed in 1941, damaging particularly the south east corner, but re-opened in 1946 (Brown). The architect of the repair work is not known, but C H Murray and R W Pite of the firm Murray, Delves, Atkins and Pite undertook further repairs in 1963 (ICBS), which were in turn taken over and completed in 1965 by J D Clarke and Partners. The main work was stabilising the chancel floor which was subsiding despite the deep foundations. 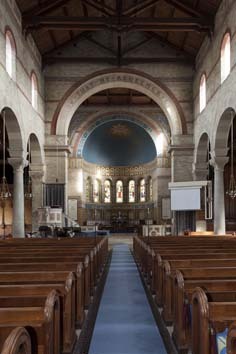 The same practice has carried out more recent work to the tower and apse (their website). Font: Surprisingly small, but of marble. 1. (In apse and west roundel) Heaton, Butler and Bayne, c1898 (www.stainedglassrecords.org retrieved 11/2/2013). Much was destroyed in 1940-41, particularly on the southern side of the apse. After the war this appears to have been replaced by copies of the original glass in the 1950s, though made by a different company as Heaton’s had gone out of business. Unfortunately, the replacement work does not match the quality of the old. All the west windows are of the same date and by the same firm, except that the west window of the north aisle dates only from c1906. 2. There is said (Hadley list) to have been glass by J Powell and Sons of 1886 (designed by C Hardgrave) and 1908 but this is no longer to be seen and was probably destroyed in World War II. 3. 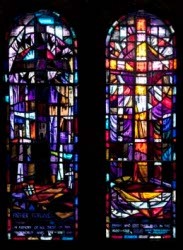 (South aisle, third window, M May, c1970 (ibid). Abstract war memorial window, mainly in purple and red. Pulpit: Designed by Strong to match his other work in and around the sanctuary. My thanks to Nick Wiseman for the photographs and for establishing more precisely the fate of the Heaton glass.